Kasich said because he doesn't use a teleprompter or notes, he sometimes doesn't say things as artfully as he should. Republican presidential candidate John Kasich said he's unscripted and will continue operating that way — even if it gets him in trouble. Kasich raised eyebrows at a town hall event in Fairfax, Virginia, on Monday when he said that he first got elected to the state Senate in part by "women who left their kitchens" to campaign for him. "How did I get elected? I didn't have anybody for me," he told the group of about 1,000 people. "We just got an army of people and many women who left their kitchens to go out and go door to door and to put yard signs up for me." Kasich said at that time "things were different." "Now you call homes and everybody's out working," he said. "But at that time -- early days -- it was an army of the women that really helped me get elected to the state Senate." Kasich was first elected to public office after running for the Ohio Senate in 1978. At age 26 he was the youngest person elected to that office. A woman in the audience stood up at Monday's town hall and referenced the kitchen remark. "First off, I want to say: Your comment earlier about the women came out of the kitchen to support you? I'll come to support you but I won't be coming out of the kitchen," she said. Democratic candidate Hillary Clinton, meanwhile, responded by tweeting that a "woman's place is... wherever she wants it to be." Kasich told reporters in Charlottesville later Monday that women have played a big role in his administration and campaigns. He said because he doesn't use a teleprompter or notes, he sometimes doesn't say things as artfully as he should. 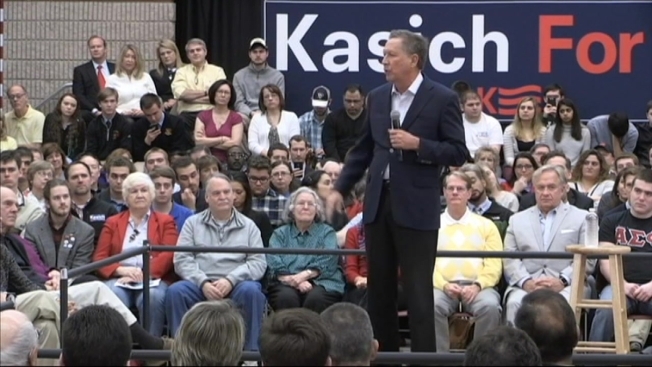 Kasich said he was going to try to be "a bit more careful" but wouldn't change his ways. "I'm going to continue to operate on a high wire without a net," he said. "And frankly, I'd like to see everyone whose running for president get out of the scripted role and start being real and take questions." Kasich's appearances in Virginia come two days after South Carolina's primaries and a day after the governor signed a bill into law cutting off state funding to Planned Parenthood. Also on Monday, Kasich scored the endorsement of former Homeland Security Director and Pennsylvania Gov. Tom Ridge.